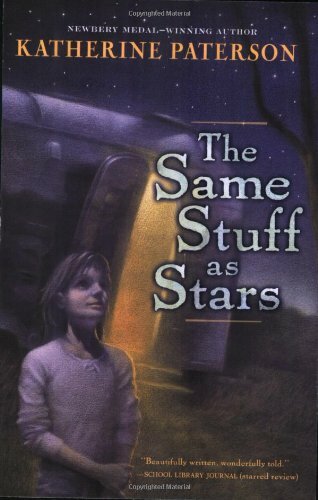 Review of "The Same Stuff as Stars"
The Same Stuff as Stars by Katherine Patterson is an award wining novel for young people. It is the co-winner of the Paterson Prize, an Honor Book for The Red Mitten, the Judy Lopez Memorial, and the Jane Addams Awards. It is an interesting and quirky novel about a young girl abandoned by her mother and forced by circumstances into the role of mother for her unruly younger brother and housebound great-grandmother. The Same Stuff as Stars is set in contemporary Vermont. The deck of life is stacked against eleven-year old Angel Morgan. Her father, Wayne, is in prison for robbery. Her mother, Verna, is immature, self-centered, and very unreliable. Her seven-year old brother, Bernie Elvis, is an undisciplined bundle of energy, and handful of trouble. When Verna decides she has had enough - enough of prison visits, enough of children, enough of poverty, and enough of loneliness - she hangs her hat on the next available man. The only catch is that he does not want children. Verna tries to hide her plans from Angel and Bernie under the guise of a quick visit to the country and Wayne's great-grandmother. Angel, however, has experienced too many disappointments from Verna to trust her promises. First Verna did not pack a suitcase, second she did not make up her bed for the night, and third as soon as it was dark, she made a beeline for her truck disappearing down the driveway without so much as a "tootles". Angel was convinced when called the apartment only to discover the number had been disconnected. So much for Verna's promises! Angel soon learns her grandmother, while a good woman, is hardly capable of caring for herself let alone two children. Once more Angel finds herself in-charge. She also soon discovers her new home is quite old fashioned. It lacks most of the modern conveniences she is used to using, but she knows she must manage. As days turn into weeks then months, Angel learns to walk to town for groceries, cook on a single burner, provide heat with a wood stove, and feed three on a social security check meant for one. She also works the system to register her brother and herself for school. This would have proved too daunting if it were not for the inspiration of "the starman" and his telescope, and the help and support of the aged town librarian, Miss Liza. The Morgans - children and great-grandma - might have slipped quietly into the sleepy world of a Vermont winter if not for the vulture-like return of Verna who swooped down and carried off Bernie. This event would prove too much for the already fragile family and spark more than just questions about one missing child. The Same Stuff as Stars by Katherine Patterson is an award winning novel. It will make the reader want to laugh and cry. The book is recommended for ages 10 years and up. The book is highly recommended.